"GENERAL HAWK has formed two groups to solve this deadly problem. Who will be successful? Will it be the Zombie Hunters whose mission is to eradicate those infected or will it be the E.C.O. (Emergency Chemical Operations) Force trying to rescue and find an antidote for those afflicted? And, what about the team members who become zombies, are they a casualty of war? If too many are turned, who will be left to complete their mission? Only time will tell and it’s running out!" This was the description provided by the G.I. 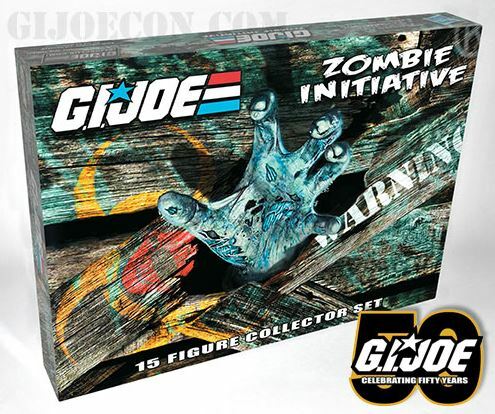 Joe Collector's Club for the 2014 "Zombie Initiative" 1:18 convention set that was made available at the annual G.I. Joe Collector's Convention held in Frisco, TX. The 15 figure boxed set and the accompanying souvenir items weaved a tale of undead adventure and survival as the dreaded "Compound Z" first hinted at in the Pursuit of Cobra line reared its ugly head once more.